If you’re a Mac user with a lot of video files and movies, you may wonder how you can play multiple video files one after another in a playlist. While the native Quicktime app is a great media player, it doesn’t offer a playlist capability, so if you want to play all videos from a folder on the Mac you will need to rely on a different app. 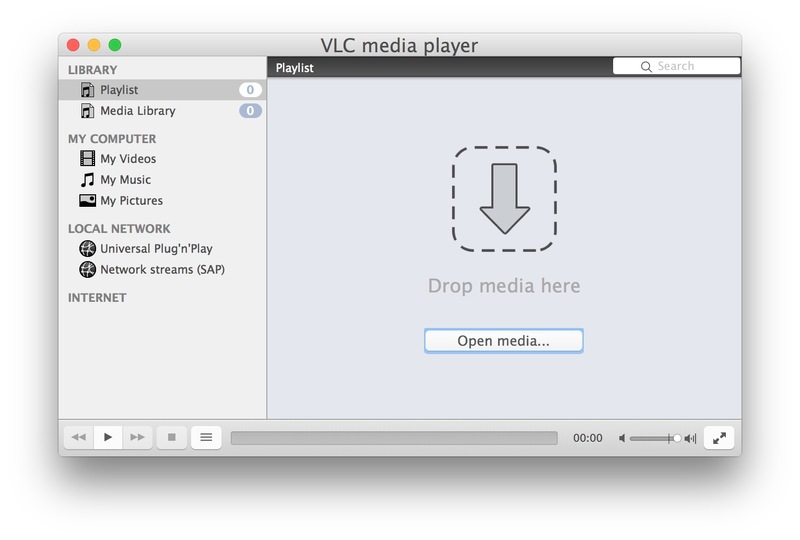 There are a few options for playing multiple video files from a folder or some other movie collection, including even using iTunes, but perhaps the best option for most Mac users is VLC, a free third party app that is also a bit of a swiss army knife of media playing, not to mention cross platform compatible, and arguably one of the best video players on a Mac. 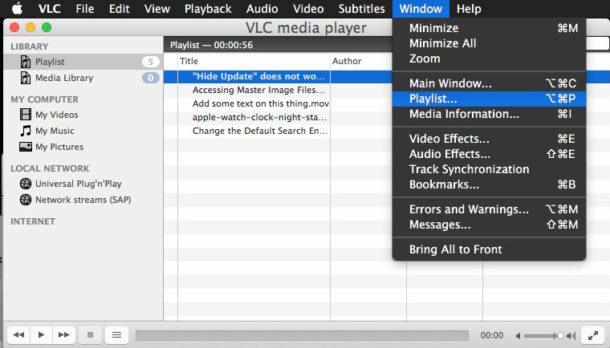 You can drag an entire folder of videos or movies into VLC to create a playlist, otherwise choose a collection of movies to play by selecting multiple files on the Mac and dragging those into the media player app. While this applies to the Mac, you can accomplish the same sequential video playlist on iPhone and iPad by using VLC for iOS, which also plays a wide variety of video formats and types. And since VLC is cross platform compatible, you can also setup the same playlists the same way on a Windows PC, Android, or linux machine too. As mentioned before, you can also create a new playlist in iTunes and play multiple video files that way, but VLC is a better choice for many users because VLC has a very broad range of media file compatibility and is able to play MOV, MKV, AVI, WMV, amongst many other video file formats. If you know of another (or better) approach to playing multiple video files in a playlist on the Mac, let us know in the comments below! Great for dash cam footage and still extraction. Local police love clear data like that. You can also use Quick Look. Select all the files you want to play, press space bar, click the full-screen button and that’s it. That may not be the best option, but it’s the one I use every time and it works like a charm. Perhaps I’ve misunderstood what you have written, in which case I apologise. However, you can make a video playlist in iTunes as easily as making a solely audio one. The chances are that the videos will not show up in the Mac Menu as videos but as long as they are video files and marked as such in the options, they can then be grouped into a playlist. I have two such playlists. One I have called “Home Videos” which is what it sounds like but I also put some downloaded and commercial videos in there because mainly I use it to separate those from the music videos files. The other playlist is within the Music section and is labelled “Music Videos” and this is where I put those because, in my case, most of them are youtube downloads and such, they don’t automatically show in the MacOS main Music Videos listing. If this is all obvious to everyone and I’ve just missed the point, well that’s me – dumbo! 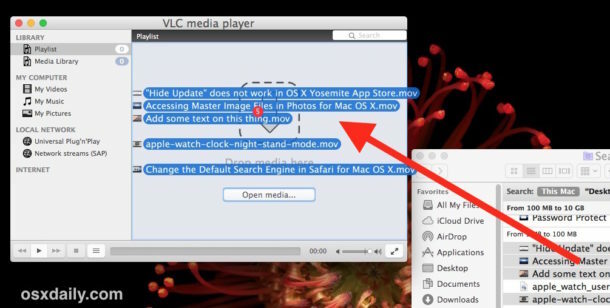 You can also change the file type to open in VLC instead of QuickTime. Get ready bro in the file change open with to VLC for all. Then you can select a group of files and they automatically are put on n a playlist. You can use iina player: just start play the first video in a folder and, automatically by default, iina will play the remaining videos. It’s the first time I hear about Ina. Thanks for the info. I wish VLC for iOS would support playlists.